Home Cryptocurrency Trade Cryptocurrencies With Minimum Risk By Buying Bit20! Trade Cryptocurrencies With Minimum Risk By Buying Bit20! A unique element of Blockchain technology is that it delivers an opportunity for financial concepts to be empowered and implemented on a global scale. Ladies and gentlemen, we can now invest in a digital currency index! It is known as Bit20! This is a digital currency whose price is determined by the average value of the top 20 cryptocurrencies. This token is abbreviated as BTWTY in crypto-exchanges around the world. As such, you can purchase it to hedge your cryptocurrency investments. BTWTY is fully anonymous, secure and transparent. Quite interestingly, the fees which are charged per transaction are very low due to its structure. Bit20 is the future of hedge investment! What does Bit20 have to offer? BTWTY is developed such that it packs all the top digital currencies into 1 token. By buying it, you can get a piece of all the best cryptocurrencies at once. This provides you with convenience and undeniable value. The BTWTY coin is designed such that its value is dependent on the average value of the top 20 digital currencies in the world. Today, the cryptocurrency market is getting deflated. This is due to enthusiastic mining and growing demand for cryptocurrencies in international markets. These factors are creating fewer freely-available coins. Hence, the tokens are increasing in value dramatically. As such, the value of BTWTY is growing and it has positive future projections. As such, BTWTY is an excellent cryptocurrency for buy and hold investors. Traders, investors and enthusiasts can quickly get this cryptocurrency. BTWTY is already listed in some of the top crypto-exchanges. By visiting exchanges, you can purchase some BTWTY. Furthermore, you can trade it with other cryptocurrencies and create ample margins on your holdings. 1 BTWTY it currently equivalent to $28.998.50 USD. A great feature of BTWTY is that you can buy it using cryptocurrency or fiat currencies. Therefore, investors, business owners and day traders have a variety of choices when purchasing this cryptocurrency. Moreover, you can load BTWTY into your cryptocurrency debit card. In this way, BTWTY has real-world value and practicality. You can use it to perform shopping on the Internet or in the real-world. The main characteristic of Bit20 (BTWTY) is that it is fully decentralized. It is built upon the Blockchain. Thus, it is fully trustless. This makes the Bit20 token compatible with Smart Contracts. Due to this feature, it is flexible and can be implemented in Blockchain-based activities. Every time that BTWTY is utilized in a transaction, it is recorded in the Public Distributed Ledger. Your transactions with BTWTY cannot be replicated. As such, it is fully secure. For this reason, BTWTY can be utilized as a serious economic instrument. Bit20 was developed to be highly flexible. This means that it can be traded with other cryptocurrencies quite easily. It holds value according to the performance of the top 20 cryptocurrencies globally. Not only can you use it to hedge your investment, it is also a good measure of the overall performance of the crypto market. An interesting feature of Bit20 is that it has an elegant foundational structure. This token was launched on 21st July 2015. Its price at this time was governed by the price of gold. Upon arriving at this value, it was subdivided into 20 sections with each of the top cryptocurrencies today occupying a margin section. After the launch, the developers of Bit20 created a special algorithm. 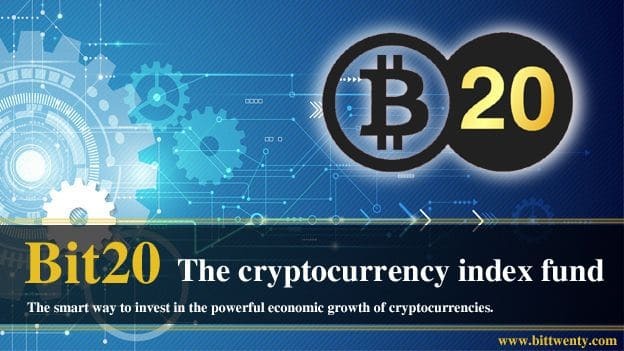 It updates the index of 20 cryptocurrencies so as to revise the value of the world’s top 20 cryptocurrencies. This ensures that BTWTY is fully reliable. The revision is performed every month. By doing so, the developers ensure that the price of BTWTY does not suffer too much volatility. Today, there are over 1,600 cryptocurrencies. If you want to invest in them, it is always ideal to buy the top performers. 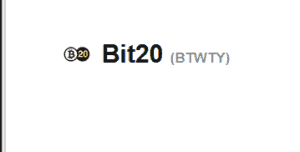 Bit20 (BTWTY) allows you to purchase all the top 20 cryptocurrencies in one purchase. This digital coin essentially combines them and assigns an average price. Value investors have received a great gift in form of BTWTY. It is an excellent instrument for buying and holding all the top digital currencies today! Previous articleWhy the BitMart Exchange is the Future of Cryptocurrency Trading!